White stylized Kanji character of Gun of Gunma and three white crescents which stand for three mountains Mt. Akagi, Mt. Haruna and Mt. Myougi on purple colour. Purple was selected as refined coulour which is believed to be suitable for Gunma which has lots of cultural inheritance. Adopted 25 October 1968. The construction sheet says "Purple, hue number 21, brightness 12-13, chroma 5-6". Sounds like Munsell, but I didn't think purple hue no. 21 made sense in that system. 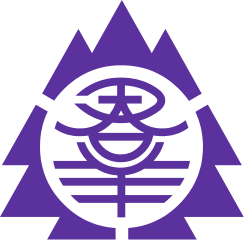 The prefecture emblem was adopted on Oct 1st 1926 by Notice No 328. The emblem is stylized ancient kanji Gun of Gunma “in three mountains”. The prefecture flag was adopted on Oct 25th 1968 by Notice No 553. The flag proportion is 2: 3. The kanji Gun in the flag is not surrounded by mountains.